I've gotten quite a bit of information recently on CDE's Grandpa Gustav Berneburg, but in the end it seems quite confusing. I've had several wonderful people helping me, including a lady who is the secretary at the Reformed Church (Calvinist) in Linden-Hannover, Germany, who has done quite a bit of searching through the files for me. In addition, I've done a lot of searching this and that database, and finally reactivated my "World Explorer" membership at Ancestry.com so that I can get into their German databases. That's helped me a little in our progression. 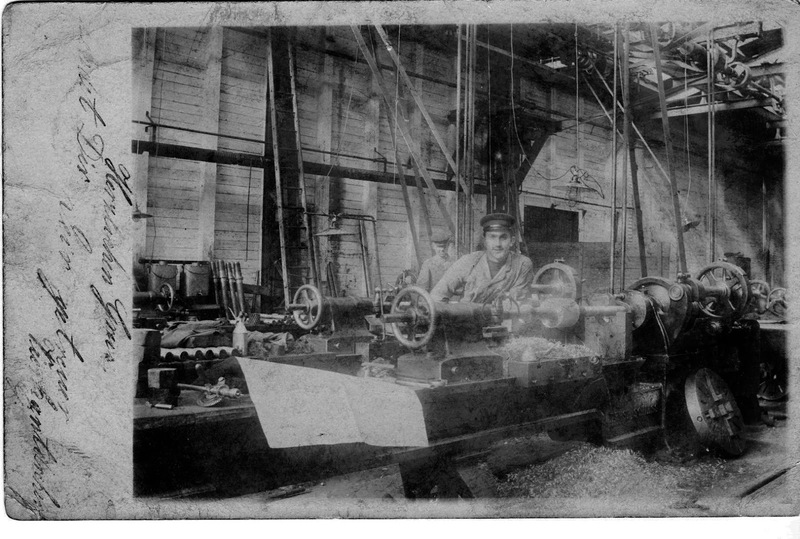 The caption says "Heartfelt greetings from your true square-head(bolts)-turner, G."
This is a picture of Gustav Berneburg (Grandma Walli's father), maybe in a ship, otherwise in a machine shop somewhere in Germany. He traveled on ocean-going ships as a machinist, fixing things and fabricating things, I guess. Our information has it -- from Grandma Walli's sister-in-law, who wrote down a lot of family history -- that Gustav was born on June 3, 1884, in Linden Hannover, Germany. He was the son of Andreas Berneburg (d. 1898), a stone-setter, and Hermine Kleemann (d. 1919). Here's where it gets a little messy. *I've put Gustav into the birth order of these children, though he is not the child of Johanna Schmidt Berneburg. Now, I know that Gustav had a brother and sister that are on the list -- "Fritz," must be Hermann Fritz, and Sophie, who later became Sophie Knolle when she married Hermann Knolle. I have confirmation of this directly from the church records, and I met Sophie Knolle in Germany, in 1966. The family also has a written record that Gustav had a brother "Willi," so I'm not sure that that would match up with Heinrich, because there's nothing that could morph into "Willi" in his name. And as for Johanne Dorette, because I can find no other record of her in the church records -- confirmation, death (both of which are there for Sophie), I can only conclude that she died early. I have been unable to find anything definitive about Hermine Kleemann -- I find a birth record for a "Luise Hermine Kleemann" in 1858, in Lippe, which is about 57 miles from Hannover. She would have been 26 at the time of Gustav's birth. No reason to think this is she, however. I also found in a directory for Braunschweig for 1911, a "Frl. Hermine Kleemann, Krankenpflegerin," which is a nurse that goes to houses, especially where a mother has just given birth. Braunschweig is about 45 miles from Hannover. I will continue to look for evidence for Hermine, for Gustav's birth, and for a brother named "Willi." One thing about this odd situation might make sense -- we know that Gustav had "anger management issues," and was a person who could be very cold and unloving. If, in fact, he was not a legitimate son, he could have had an unpleasant upbringing that may have led to his resentments and unhappiness. We also know that he was the one that "flew the nest," that went to Bremerhaven, went to sea, and finally emigrated to the United States -- the only one in his family to do so. So much for today. The digging goes on . . .